Frequently, I see parents using punishment to try and influence their teen’s behavior, often resulting in power struggles and resentment–on both parts. It is also not uncommon for parents to repeat similar parenting responses to the ones they saw modeled by their own parents. My job is to help parents slow down and become curious about what their teen’s behavior may say about what they are needing in that moment. 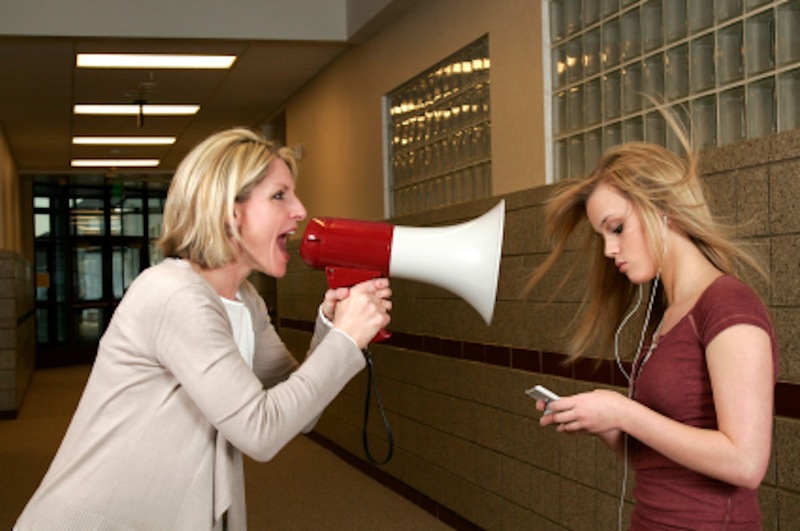 Although it is definitely appropriate to set boundaries and have expectations for your teen’s behavior, it is also essential to teach them helpful ways of responding to their frustrations and challenges. I provide parents with a safe environment where they can feel understood. Through discussing sensitive or heated topics with the parents of teens, I have a wonderful opportunity to give these parents a direct experience of what sensitivity and responsiveness to their teen can look like. If your teen or young adult child is struggling socially or emotionally, I can help you to discover the cause and remedy it. Providing service for: Los Angeles, Santa Monica, Pacific Palisades, Malibu, Beverly Hills, Beverly Glen, Culver City, Brentwood, Westwood, Marina Del Rey, Mar Vista, Encino, Sherman Oaks, Topanga Beach and Topanga Canyon, Ocean Park, Hancock Park, West Hollywood. During the teenage years, the pressure to conform with their peers can be incredibly strong. If kids feel different, inadequate or deprived in some way, then feelings of self-loathing and depression may be the result. With Facebook, Snapchat and Instagram so prevalent, teens are being bombarded with images that they feel they need to live up to. There are also increasing concerns about competition for college, and the endless hours that are going into creating the perfect resume with extracurricular activities and advanced coursework. Today’s adolescents are exhausted, overwhelmed and breaking down. It is important for parents to make a distinction between situational depression: which is a normal reaction to stress or loss, and clinical depression: believed to be caused by brain chemistry and not related to external situations. Regardless of the cause, it can be beneficial for teens to receive support going through these periods from a trained professional. “The idea that one must be, and look, endlessly cheerful is a destructive and daunting expectation for teens.” says Dr. Andrew Weil, who feels that kids need to learn that happiness is not some end point to be achieved. I teach teens how to discover a sense of peace and contentment through life’s ups and downs, see and accept life as is, and find ways to respond effectively to each situation. Is Your Teen Emotionally Intense? Teens who are extremely sensitive experience day-to-day life even more vividly and deeply. With their unique ways of perceiving the world, “emotionally intense” responses to challenges at home, school, work or in relationships are common. 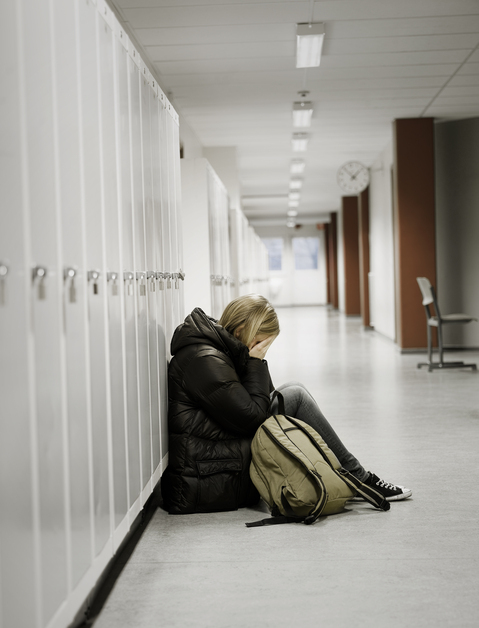 Unfortunately, this emotional intensity is often misunderstood, and these intelligent, caring, and expressive young people are frequently mislabeled and misdiagnosed. There is great value in highly sensitive adolescents learning to manage their vulnerabilities — and harness their strengths. I help highly sensitive young people to expand their ‘window of tolerance,’ so they are less easily triggered into states of acute stress, rage, and panic. 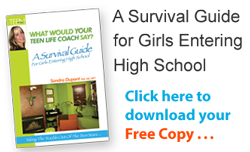 I can teach your teen to harness their strengths and manage their vulnerabilities–so that they can thrive. Being in the world with a highly responsive nervous system is not a disorder. But it can be challenging for parents and teachers to understand this young person’s hesitancy before trying new things, and their reactiveness to feeling overwhelmed. Some teens may begin to show symptoms of emotional challenges during adolescence. If not addressed these symptoms can follow them into adulthood, leaving them emotionally immature and unable to engage in healthy relationships. You may be hesitant to take your teen to a therapist to address these issues, afraid that they will be labeled problem kids or learning disabled. Seeking my assistance as a Teen Life Coach can offer you another opportunity to remedy these problems. Coaching can be a fun and uplifting experience for your child. 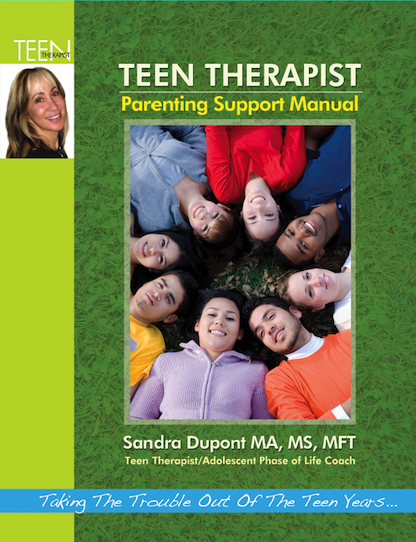 In contrast to therapy, where the therapist is seen as the expert, coaching is a collaborative effort between myself and your teen. The focus is on helping your teen create a vision of the life they would like, and supporting them in their journey towards that goal. My training as a Teen Therapist has paved the way for developing more creative and positive ways for working with you and your family. My goal is to create a safe, non-judgmental space for your teen to explore their obstacles, ask their questions and express their feelings. Sometimes you may not have the time or energy to be as available to your teen as you would like. It has been said that “It takes a whole village to raise a child.” It can be helpful to know that I am here, should you ever want or need assistance. Adolescent counselor, family therapist and respectful parenting coach for over 10 years based in Santa Monica, California. This FREE Teen Therapist Parenting Support Manual is designed to help you and your teen reflect on their behavior as well as your expectations for their behavior and open a discussion where mutual understanding and cooperation can take place. To be used to identify the behaviors that are expected from your family members. To be used to clarify your expectations for your teen with regard to household chores, checking in, homework, grooming, computer usage, etc. Can be used to discuss values you want to instill in your teen. cultivate in order to successfully participate in the world. Allows you to put in writing the behaviors and responsibilities you and your teen have agreed to, along with the agreed upon positive and negative consequences when those behaviors and responsibilities being upheld or not. As a parent, you are expected to provide their children with a roof over their head, food to eat, clothes to wear, medical treatment, and protection from harm. However, cell phones, computers, spending money, stylish clothes, extracurricular activities and driving or being driven to their friend’s homes are all privileges that a child may earn through respectful and cooperative behavior toward their parents. Implementing these concepts can take some time, which will vary substantially depending on the emotional maturity of your child. Don’t feel like you have to tackle them all at once. If there are other significant issues that are being addressed, you may want to study these concepts and implement them when you can. In some situations, parents have not had the previous experience of entering into a similar discussion with their own parents. Therefore, I am more than happy to work together with you and your child to facilitate these discussions. 1. Isolation can be caused by the way these teens look, dress, act, or a combination thereof. 2. 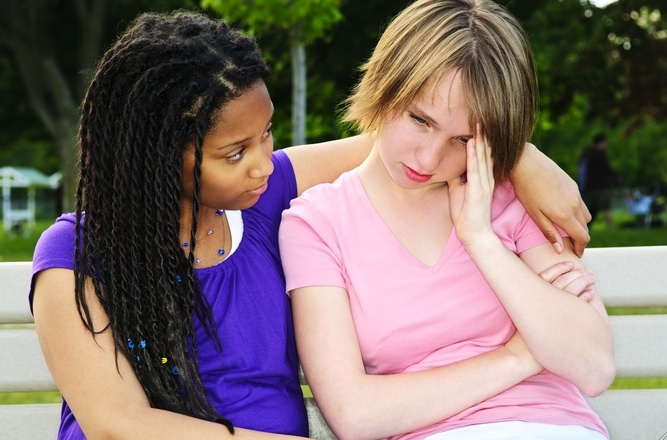 Moodiness and erratic or volatile behavior can drive adolescents away from their peer group. 3. Shyness can be a cause of social isolation. 4. Some adolescents may be ostracized by peers due to their excelling academically or underachieving. 5. Adolescents who spend too much time on the internet or playing video games lose touch with their friends. They may replace genuine social interaction with online conversations with strangers. 6. A depressed adolescent often loses interest in everyday activities, dropping out of social groups at school. 3. Let others get to know them? 4. Express what they feel and need? 5. Recognize hidden agendas in others? 6. Communicate respectfully within the family? 7. Set appropriate limits with regards to their bodies? 8. Be assertive (not aggressive) in their communication? I work with teen clients one-on-one to identify areas where they can improve their social skills, and teach them tips and tricks to improve those skills. I can teach your child how to feel more empowered in social situations. Is Your Teen Highly Anxious? When your teen talks to me about their fears and anxieties, I listen carefully and respectfully, without discounting their feelings. Some adolescents are just naturally more timid than others. As their bodies, voices, and emotions change during adolescence, these sensitive young people may feel even more self-conscious. In extreme cases, the adolescents can become very withdrawn, unable to overcome intense self-doubt and worry. I work with these teens to trace their anxiety to specific situations and experiences, and teach them techniques to help them reduce the overwhelming nature of their anxious feelings. While anxiety disorders can cause considerable distress in a teen’s life, the overall prognosis is good. Extreme anxiety in teens may require a combination of treatment interventions that can include meditation, Neurofeedback, or a referral for medication. The most effective plan is one that is individualized to the teenager and their family. Anxiety carries information. My goal is to help my teen clients learn self-soothing techniques to manage their anxiety, so they can move beyond it to reach their goals. What happened today that made you happy? Did anything happen today that made you sad? Was there anything that caused you to feel frustrated? Be able to identify and articulate their concerns. Be able to consider a range of possible solutions. Be able to reflect on the likely outcome of those solutions, as well as the degree to which they are mutually satisfactory. How can you help your teen gain the skills of flexibility, adaptability, frustration tolerance and conflict resolution? By involving them in the decision-making process in a collaborative way. Explosive behavior occurs in teens when the demands of the environment exceed their capacity to respond adaptively. If you believe your teen is being overly reactive because of lagging skills and unresolved problems, then offering rewards and punishments may not be the best approach. Solving those problems and teaching those skills would make much better sense! I help parents get the whole picture of what’s going on in their teen’s mind, including the neurological changes that occur during adolescence. The reason I offer families with teens a FREE Initial Parent Consultation is to give you the opportunity to get a better sense of who I am–and how I work. In learning more about the symptoms your family is experiencing, I am able to make recommendations on how to address the challenges your teen is struggling with. Before starting family counseling, it is important for parents to reflect on what they hope to get out of the experience of therapy. It is also essential for you to examine your readiness to embrace the changes that may be necessary for your family to make. Family therapy is a collaborative relationship between you and I, with parents needing to reinforce the work I do at home. First, and foremost, you want to maintain open lines of communication between you and your teen. Yes, I understand that this is sometimes easier said than done. Consider the possibility of agreeing to disagree; for there is value in being able to talk to them, as well as listening to what they are telling you. I have found that teens can be very forthright and honest. They often want to tell you about the mischief they are conceiving, as they are quite proud of themselves. For every secretive child, there are 5 more who don’t think twice about enthusiastically sharing about some of the outrageous things they are planning — or have done. Teens are amazing. Teens are wonderful. They are also oblivious of the fragility of these human bodies we reside in. They think they are invincible and will live forever. Do you remember when you used to feel that way? The good news is that you survived your Teen Years. Now it’s your turn to pass on your wisdom–to this next generation.